The Doodlers began in Longview Texas. They listened to many of the pop vocal groups and jazz ensembles of the day, and aspired to sound similar to them. Thanks to an innovative high school choir director, the Doodlers actually met in choir and then formed their own group. 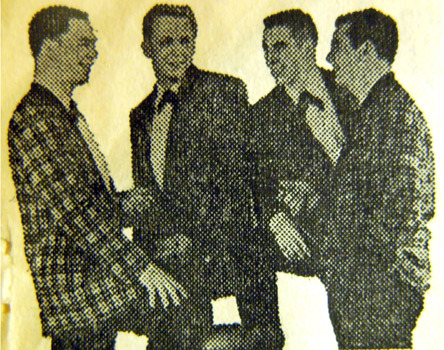 Pictured above left to right is Randy Williams bass, Jay Hoyle baritone,(Mike Perkins had been the original baritone in high school)Don Florey second tenor, and Wehlan McPherson- high tenor. While playing some dances in the Houston area, a shady promoter told them about all the money they could make singing, and they cautiously followed. Sure enough, he did not work out, and they were back on their own. Fortunately, William T Jones of the Jones Apothecary (drug stores) in the Houston area, had a chance to hear them perform. He liked their sound and signed them to a recording and management contract. The Doodlers played some local venues, and then were carted off to Chicago to get choreographed and start performing in the night clubs of the windy city. Along the way, the Doodlers cut two records. The first sold well in the Midwest and beyond, and was called Linda Sue. WIND radio DJ Howard Miller gave it a ton of spins. Miller actually commanded nearly 60 per cent of the morning audience in Chicago during his peak of popularity. The Doodlers also were represented by the William Morris Agency, one of the biggest artist representation organizations of the time. There was a second record called the Dangerous Dangeroo. Half dragon and half kangaroo, it was a nice piece which was intended to compete with Sheb Wooley's Purple People Eater. They ran contests where kids would draw their own idea of what the ultimate Dangeroo would look like. They had a chance to sing with Elvis Presley once in Kileen, Texas, and it must have been an unforgettable experience. They toured all over the country, mostly in their own station wagon. The ride lasted almost three years, before they had some issues with Jones, and Wehlan McPherson decided to go home and get married. The Doodlers then called it a day. Below I have the two records that the Doodlers waxed, and you can listen to all four sides. Also, listen to my interview with original Dooder Randy Williams Here! The Jones record company issued a specialized sleeve for the Doodlers. It is a picture sleeve of sorts, though not in the same tradition as was manufactured for some of the big name artists which had their mug plastered on the entire sleeve with no hole. The Doodlers had their picture on the upper left and lower right corners, on both sides of the sleeve. Although it's not completely clear, the sleeve may have been sent out with both records the Doodlers waxed. On the sleeve, Jones is listed with offices in Beverly Hills, along with his well known home base of Houston, Texas. Click on the sleeve for an enlarged view. "Linda Sue" was the Doodlers first release. It was written by Doodler Wehlan McPherson, and since it was an original song, Jones took the publishing on it. The Bobby Tinterow orchestra that backed the group, was actually the house band at the Emerald Room in the Houston Shamrock hotel. The record was made by cutting the instrumental track, and when they exited, the Doodlers came in and recorded the vocals with the previously recorded instrumental master. There was just not enough room in the studio for all of them to fit inside at the same time. The record was recorded in Houston along with the flip side , "Solitude". According to Randy Williams, there was some heavy discussion within the group, on which of the above songs should be the plug side. 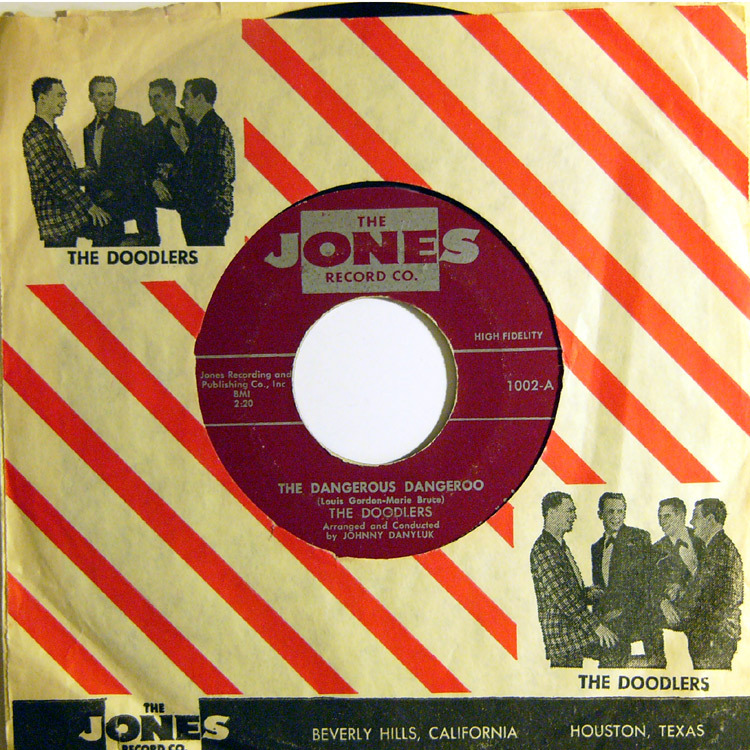 "The Dangerous Dangeroo" was recorded in Chicago at Universal Recording Studios. Sometimes just known as Universal Recording, it was originally located on top of the Civic Opera House on 20 Northern Wacker drive. It later moved to 111 East Ontario drive, and by late 1956, it was at 46 East Walton. Nearly all of the independent labels recorded at Universal. The Doodlers used the house band from Mister Kelly's which was a very well known jazz club on Chicago's Rush Street. The club had performers such as Ella Fitzgerald, Della Reese, and Sarah Vaughan come through, so the Doodlers were in good company. The club is not related to one of the same name in Japan, and As Randy Williams mentions in our interview, "The Dangerous Dangeroo" really is a nice jazz piece. The standard "It's A Sin To Tell A Lie" is on the flip, with a solo by Jay Hoyle. It was recorded the same time that both sides of their first record were recorded in Houston. No real changes on the label. Of note, Johnny "Spooks" Danyluk, wrote the Doodlers vocal arrangements and orchestrations, and Johnnie Bachemin was the Doodlers choreographer and mentor. Spooks was also Bachemin's arranger at that time. Though it is not the Doodlers, it is related. On the "A" side of this record by Lindsey Meehan, she is singing "Where Is She." On the bottom of the label, Credit is given to Doodler Wehlan McPherson. This is not the New York based Buddah label that was a huge powerhouse in the 1960's, but rather a smaller label from Saint Petersburg Florida, that pre-dated the New York label. This was reviewed in Billboard in June of 1959. Updates: Randy Williams still lives in Texas. Jay Hoyle is living in Tennessee. He was performing on cruise ships, and even made a country western LP. Wehlan McPherson passed away January 2011. Mike Perkins passed in 2010. Don Florey passed away in 1995.